NEWS: Check your pet’s chip in under 10-minutes! Have you moved house or changed phone number? Every day microchipped cats and dogs arrive at shelters but cannot be reunited with their owners because their contact details are out-of-date. 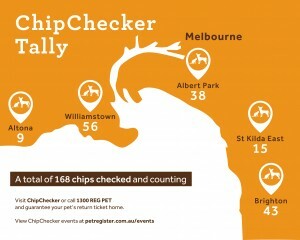 If checking your pet’s microchip has fallen down your list of things to do, then head along to an upcoming ChipChecker station at an event near you or call 1300 REG PET today! In just under 10-minutes, you can find out what contact details are on your pet’s microchip, what database your pet is registered to and whether your pet’s microchip is working. You can also use ChipChecker to update your details and use the opportunity to ask National Pet Register staff any identification questions. Upcoming ChipChecker event near you!